Mariachi not only describes a unique style of Mexican Music, it refers to the groups, the individuals in them, and the tradition that originated in the mid-19th century (see “Mariachi”- Huatulco Eye, February 2012). Many female musicians have been drawn to Mariachi music because of its broad popularity. Some were taught to play by fathers, uncles or brothers who were Mariachi. Although originally an all-male tradition, by the 1940s a woman named Maria Carlotta Noriega formed the first documented all-female Mariachi group, “Mariachi Las Coronelas” in Mexico, D.F. By 1950, Adelita Chavez had formed and was directing another successful all-women Mariachi band in Mexico City, “Las Adelitas”, closely followed by a third, “Mariachi Michoacano”. This group later changed their name to “Mariachi Estrellas de Mexico” because people had begun to refer to them as “The stars of Mexico” due to their immense popularity. 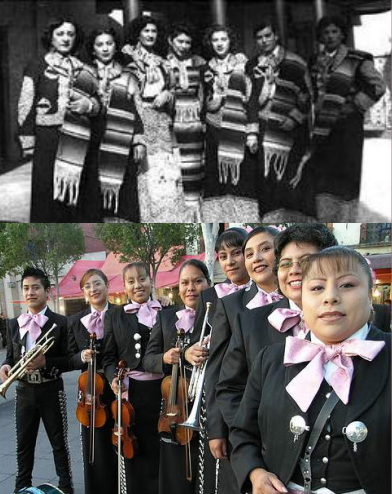 Mariachi groups were often used in film productions, which increase their popularity, and the women’s groups were no exception. Needless to say, although women were often guest singers that performed with Mariachi bands through the years, they were not normally considered members. Those with instrumental talents were forced to consider forming all-female groups simply for an opportunity to do what they loved. There are many all-woman Mariachi bands now in the Southwest United States. Because of the large Latino population in that part of the country, and the more liberal outlook, the all-female groups have encountered very little resistance and more opportunity. Most adapt a female version of the traditional Mariachi “Charro” costume (usually skirts replace pants), although the more feminine traditional “China Poblana” style is often used for special performances. It consists of a detailed embroidered blouse, scarf, and a full, often colorfully decorated skirt. Mariachi is alive, well, and world-famous, and the women of Mariachi are a vital part of the tradition.